Do you want to fly in the city of Kyoto? Yes, we can fly. This is a report about a day project to take aerial footages for a hotel’s online promotional video. No matter which time plans you choose, our pre-production arrangement rates are the same. In addition, the more time to fly the more chances to capture great shots. Even if there is the sudden downhill of a weather, we still have multiple chances for good shots. with the day shoot plan. Even though it is not the case for many projects, it is highly recommended to give us a right to decide droning schedules. Weather is extremely important factor when it comes to drone shoot which captures cityscapes or landscapes. We need the sun but weather in this areas very sensitive and we often do not see crisp sky and clear view of cities. In Kyoto shoot we had this time, we decided the date of the shoot a day before the flight. Considering movement of clouds, time of sunset and sunrise, the sun directions according to time, winds, PM2.5, and geography, we also set shooting schedules in a day. 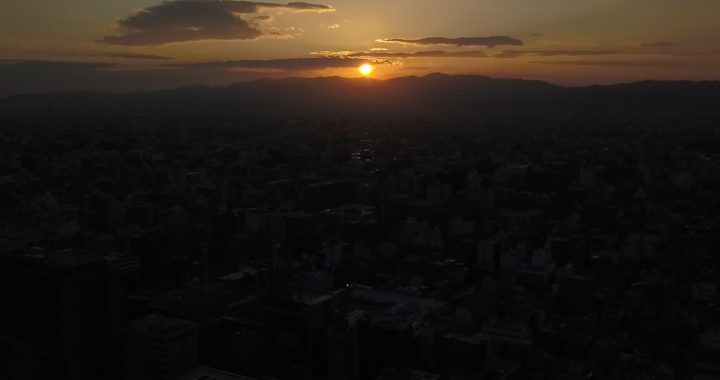 As noted in the droning service page, flying in Japanese big cities requires elaborate adjustments with public and private authorities.We have applied two authorities for this shoot. One of them requires usage fee. This kind of fee will be added to estimation, besides our arrangement fee themselves. In addition in particular in Kyoto, we also had to cope with local residents who keep watchful eyes on drone flight. You must be careful, because recently we hear the news that foreign tourist was arrested because of drone flight. Person who called the police was a local resident. Even if you have legitimate permissions for fly, you don’t want the police to come and explain your legitimacy. It will waste your valuable time and may lose great shots. In all way we had successful shoot in Kyoto and got beautiful shots. Thanks for the client and the authorities who gave us permissions.